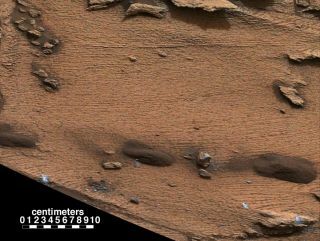 The fine layers in this rock, which was studied by NASA's Mars rover Curiosity, provide strong evidence that a lake once existed within the Red Planet's Gale Crater, researchers say. Ancient Mars featured flowing rivers and sizable lakes — but that doesn't mean the Red Planet definitely could have supported life, one prominent researcher stresses. The presence of liquid water is just one of many factors that researchers need to take into account when investigating the past or present habitability of Mars or any other cosmic body, astrobiologist and mineralogist Pamela Conrad wrote in a "Perspectives" piece published online today (Dec. 11) in the journal Science. While modern Mars lacks these characteristics, it possessed both of them about 4 billion years ago. A thorough understanding of Martian habitability would seek to determine whether the magnetic field, thick atmosphere and liquid water all occurred simultaneously, said Conrad, who's based at NASA's Goddard Space Flight Center in Greenbelt, Maryland. "It is a matter of timing: The emergence and sustenance of both life and its habitat require a convergence of the right chemicals and physical conditions in the right place at the same time," she wrote in Science. Assessing the physical conditions that prevailed in the distant past is challenging but not impossible, Conrad said. For example, NASA's MAVEN spacecraft (short for Mars Atmosphere and Volatile Evolution) is currently studying the rate at which gas is escaping from the Martian atmosphere, gathering data that should allow researchers to extrapolate this process backward in time. Conrad stressed that she's not trying to throw cold water on the Curiosity rover's recent discoveries, which suggest that Mars could have supported microbial life billions of years ago. Indeed, she's a Curiosity team member and played a key role in analyzing and interpreting the rover's results. Rather, she just wants to make sure that scientists keep their eyes open. "I think it's very important for us to bring every argument to the table when you have a complex problem under discussion," she told Space.com. "It's very dangerous to make assumptions in such definitive terms, because there could be a 'gotcha.'" It makes sense for habitability discussions and research to focus on Mars, which is close to Earth and looms as a target for human exploration down the road, Conrad said. But Mars also serves as a laboratory of sorts, she added. "Everything we learn about Mars is a lesson in how to learn about other planets, and those lessons are key to enabling us to explore them," Conrad said.